I am a sailor! on a sailboat! "People always talk about how nice it would be to own a yacht and stuff," I was saying to S as we paddled our kayaks back from West Arm. "But you know, I don't actually want my own boat. I just want friends with boats who can invite me to go hang out on their own boat." Lo and behold, like maritime vision, a sailboat suddenly emerged into view. She moved smoothly across the water, manned by only one man. We waved at the sailboat as it drew closer to our kayaks. "I couldn't get a crew to come with me today," B said as he greeted us from his sailboat. "Nobody wanted to go sailing." I found this hard to believe. Who would turn down the opportunity to be on a boat? So I graciously volunteered to get on the boat, the next time she sailed. The boat's name by her previous owners is the Arctic Mariner, which makes sense. She's a small-sized sailboat with oars instead of a motor when there is no wind. Despite her modest size, she's capable of sailing all the way across the Northwest Passage, which she has done. B, the sailboat's owner, has been sailing a long time and has been all around the world. On his first voyage, he took a boat all the way from Cambridge Bay to Hamburg, Germany, which is no easy feat in icy Arctic waters. I was excited to give it a try. "Gloria, do you even know anything about sailing?" someone asked me. "Sure, I do," I said. "You hoist up the John B's sail, see how the main sail sets, call for the captain ashore..."
"Those are Beach Boys lyrics." Okay, so I knew nothing about sailboats, but I was eager to learn, as it seems like there is so much to take in. As a side note, did you know that Brian Wilson was afraid of the water? There was no wind when we first left the shore, so we rowed. It was still nice. Kids waved to us from shore, and tourists took photos of us. Eventually the wind picked up, just a little, so we released the oars and put up the jib and the main sail, so the sailboat could drift at a leisurely pace. I love being on a boat. There are just so many things that my imagination could run wild about. I am a gondolier in the canals of Venice. I am a pirate, scanning the seas for treasure. I am Jack Sparrow. I am Pi. I am an extra in a Lonely Island video. "Hey guys, I'm on a boat!" B was kind enough to let me try working some of the sails myself. There were so many knots in what seemed to be a complicated rope system. How do I know which one to pull? What if I yanked the wrong rope and instead caused the boom to swing around and knock me off the boat, just like the way it always happens in Hollywood comedy films? Luckily, I found the right rope. But I still kept my head low for much of the trip, just in case. S and I took our kayaks out to head over to West Arm. It was my first time going to West Arm, a popular fishing spot and cabin area outside of town. There's an ice road that leads there in the winter, and a dirt road in the summer accessible by ATV, but it was a fun challenge to get there by kayak. It's about seven kilometres out (so a fourteen kilometre trip in total), taking about 4 hours going at a leisurely pace, so I had plenty of time to reflect while we paddled. how to get to West Arm. The "A" is Cambridge Bay. Here are some thing that you think about while you kayak in the Arctic. You notice how beautiful the water is, with its brilliant teal-blue-green colours, how deceptively inviting it looks, like the Caribbean Sea. You know that if you jump in, it will not be warm like the Caribbean; it will be very cold, inviting possible hypothermia within minutes sometimes, and that is why you are wearing a wetsuit, just in case you tip over. Still, the water looks beautiful. You notice the direction of the wind and the currents going against you, and you wonder if the wind and currents will still be going in the same direction on your trip back, making the paddling easier for at least one way. With your luck, the wind will probably die out. You wonder if you will see any seals. You wonder if you will see any narwhals. You wonder if you are going to get shot, if there are narwhals. I am told that sometimes on this route, narwhals will come and swim around your kayak. It's a magical moment, until suddenly you see bullets being fired near your bow. It's not easy shooting photos of whales. That's because whenever the whales do appear, so do the hunters. Hunters who are busy shooting at them, and not with camera. Remark: "Look! Out in the water there are whales!" Reply: "Wow! Let me tell the kids so we can take pictures." Reply: "Will you please get out of the way? Let me tell the elders so we can hunt them." 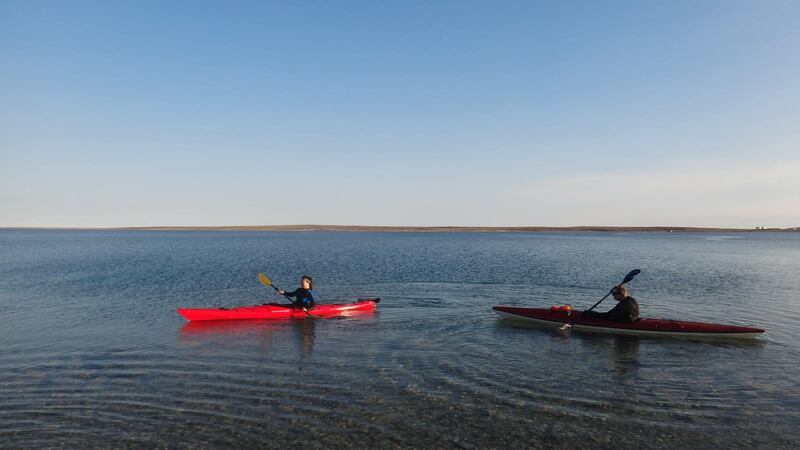 So when you kayak, you worry about narwhals appearing and you worry about getting shot. You also worry about being knocked over by a whale. Someone told me a story about how they were out fishing in a little boat, when they saw/felt/sensed something very large pass under the boat. And then all of a sudden, a humpback whale broke the surface of the water on the other side of the boat, causing splashes and waves everywhere. Sort of like what happened to the divers in British Columbia this week, who narrowly escaped being swallowed whole by humpback whales. A kayak wouldn't stand a chance. And so you worry, just a little, about whales. It was while I was thinking about polar bears that the magnificent cliffs of West Arm began to show themselves. Cambridge Bay is a generally flat region; there are no rolling hills like those in Iqaluit, and in fact the land is mostly so flat that you can see across the tundra for miles, Mount Pelly a little blip on the horizon. But riding the waves to West Arm, the shores gradually become cliffs, rising high above your head, with cabins occasionally dotting them with what must be a wonderful view, and the perfect spot for a sundowner, if sunsets existed here in the summer (this, along with the restriction of alcohol, is probably why sundowners are not a tradition here). And then it was time to go back. The wind, indeed, had died down and the sun was out. I was disappointed to lose the wind at my back, but the sun was very welcome, and our kayaks moved smoothly over the calm waters. Looking for a good cause to donate to these days? On October 6, Leanne will participate in the Canadian Breast Cancer Foundation's Run For The Cure. Twenty years ago, when Leanne was a baby, and my brother-in-law Kevin was just five years old, their mother passed away after a brave fight with breast cancer. Leanne has been participating in the Run for the Cure for several years now in memory of her mother. It's a wonderful way to pay tribute to her memory, and a noble cause. You can make a donation here. As a reminder, I am also collecting donations for the Polar Bear Dip. On August 2, I will be jumping into the Arctic Ocean - without a wetsuit - as part of a fundraiser to collect money for a new community facility in town. It will be cold, very cold. You can read more about the event and make a donation here. And now, here are some random kayaking photos, in case you haven't been getting enough of those this week. the sea can we use for storage as well as a change room, which is a vast improvement over last year, where people had to change in and out of their wetsuits on the side of the road - a bit awkward, you have to admit. I decided to give the Britney Spears (my kayak) a break for a day and took the canoe out instead. I wanted my husband to come along, and there's really nothing more romantically Canadian than going out to a remote isolated beach in a canoe together. I call this shale stretch of shoreline Lonely Beach, because I've never seen anyone else there except us. 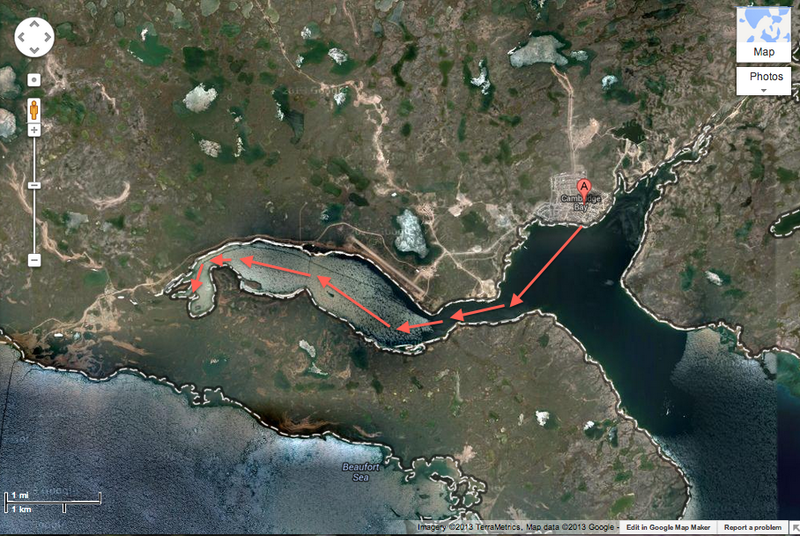 It's about a three kilometre journey along the Beaufort Sea coastline, past the airport. It's just far out enough that if you sit on the shale-covered beach, you can barely make out a view of the town off in the distance, and you feel pleased as punch that you've discovered about this quiet sanctuary. Just you, you and the mosquitoes. The channel that leads to Lonely Beach is not particularly wide, but is surprisingly deep. Only a few metres away from shore, the sea bottom suddenly plunges to a depth of three hundred feet, a fact that terrified me for some reason and kept me from wading in the water too far. Somewhere in that dark crevice lies a plane that once crashed there....and ghosts? see the dark spot? That's the underwater cliff that suddenly drops off to the deep end. see the white spots? That's sea foam...or ghosts. Because of the depth of the sea in this spot, apparently a lot of seals and narwhals like to hang out here. I was disappointed that we didn't see any during this trip. One day, I tell you, I will see a whale, one that is not dead. The journey to and from the beach was an adventure in itself. My arms were killing me; for some reason, I find paddling a canoe much tougher than paddling a kayak. Maybe it's because I must bend my will to that of my husband steering behind me. But the wind had died and the sun was out, leaving the sea at the calmest I'd ever seen it. We just coasted across the surface as though it was glass, our paddles causing slow large rippling waves in the water that was a beautiful deep colour. It was an amazing feeling that came out of nowhere, this feeling of being one with the Arctic Ocean. Here I was, a tiny little speck, riding on the back of the giant creature that is the Arctic waters. When we reached land again and dragged our canoe up on to the shore, I was suddenly overcome with the urge to run into the sea. I ran in, with Rob following after. It was a wonderful sensation, feeling the water slosh around my feet, my ankles, my thighs, my waist...until the water began to flood through my back zipper and filled up inside my wetsuit. Never let the summer sun fool you: the Arctic Ocean is always cold. I shrieked, just a little, and ran out of the water. A group of small children stood on the shore, laughing at us. "Do that again," they said. "Do it again," they insisted. I did not. The truth is, I missed the Britney Spears, and can't wait till I can take out my little kayak again. dirt path to Water Lake. Finally, a sunny day. After almost a full week of rain, I was ready to go outside. Aren't we supposed to be living in a rock desert climate? What was up with all this rain? This is how I like it: dry and sunny. The week's worth of rain had, in fact, transformed the land into a beautiful green landscape full of wildlife. We decided to go for a late Sunday afternoon hike out of town down to Water Lake to see the greenery. I've previously blogged about the road to Water Lake. It's quite a picturesque stroll, once you get past all the construction. There were also like, five million inukshuks, along the way. I like this hiking route though, because of all the random odd things that I see. We saw a snowmobile floating in the middle of a pond once. This time, there were other interesting sights. and...alien sensors in the middle of the tundra....? In other news, we have begun to experience "night" again. The sun set at 12:30AM last night. It rose again at 1:20AM. Forty minutes of night.